This is the big question people first want to know is the bathroom renovation cost but there are so many variables. It all really depends on 3 things, the size of you bathroom, the quality of the products you would like installed and the amount of products that you require. A full bathroom refurbishment for a small bathroom with standard tiles fixtures and fittings can go from around €3,000 – €4,000 + V.A.T. At bathroom refurbishments Dublin we don’t use poor quality materials as they don’t last. As we guarantee our work this just would not make sense as we would be going back replacing and repairing things. 1. Tiles, These can vary at trade price from €18 per square meter to well above €60 per square meter at the top end. Your choice of tiles will affect your quote. 2. Standard closed coupled toilet and standard wash hand basin. This is what we usually supply we have various variations in our catalogs. If you require something different it may affect the price. 3.Baths. Would you like a fiberglass bath or a pressed steel, enamel coated one one, what type of bath panel would you like? 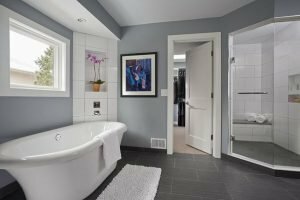 All of these choices have an effect on your bathroom renovation cost. 4.Showers. Do you have an existing shower cubicle that needs renovations or do you need one built. Obviously there is a big price difference. For example a decent set of shower doors at trade costs €250-€300. The shower itself, if you want a high pressure shower with mixer valve the mixer valves themselves start at around €200 going up to around €700. A top of the range Triton or Mira shower will cost upwards of €250. 5.Accessories. Towel rails, cupboards, mirrors, taps these all need to be thought about. We have access to all of Dublin’s major suppliers and a range of catalogs. We are happy to come round to your premises and go through everything and give you various quotes as required. We are also happy to meet you at any of our suppliers or bring samples as requested. Our job is to make your bathroom renovation as seem less as possible. To book your appointment to get your bathroom renovation cost call 016874853 today.